Samuel LeFevre was the fourth son of Isaac LeFevre and Catherine Ferree. Land was acquired for his three older brothers by their father, Isaac, but Samuel inherited this land from his father. It was part of the original Ferree land grant and these 383 acres was the tract Isaac received when the land was divided among the Ferree family members. It was conveyed to Samuel by his father in 1748. It is thought Samuel LeFevre built this mill. A date stone on the building reads 1767. There is a legend that it was one of the mills that supplied corn meal and flour for the soldiers during the Revolutionary War. 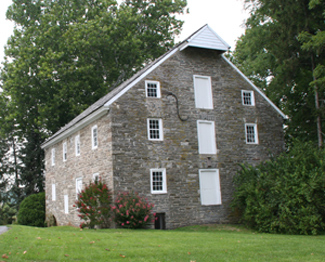 After his death in 1789 the mill was sold to Jacob Eshleman and it has remained in the Eshleman family since that time. For additional information visit this website page "London Vale Mill". Samuel LeFevre was born June 28, 1719, died May 4, 1789. Married Lydia Ferree. Lineage: Samuel LeFevre and Lydia Ferree/ Catherine Ferree and Isaac LeFevre/ Daniel Ferree and Marie Warenbur. Sources: "LeFevre Historical Spots" , Art Glenn, www.artglen.com/family/LeFevre; "The Pennsylvania LeFevres" by George Newton LeFevre, www.pennsylvanialefevres.org/book/records; "Paradise Our Heritage Our Home" edited by Robert Denlinger; "Eshleman Family Records".